looking for some help researching fj Sani, cant seem to find alot about them, can any one help with kit, insignia etc. Then we're on the same boat mate. What are you interested in? Any particular period / theatre of war? Our group mainly protrays the brigade ramcke, in a what if situaton for the invasion of Malta. You can find decent information and pictures for FJ after being grounded, but very limited for FJ medics during a jump mission. Well I'm in group portraying FJR5 so it's a multi period thing, ranging from invasion of malta, eastern front and Normandy. For the moment just Normandy. A FJ-sani in Normandy would have very similar roles to an Army, or any other Sanitaeter. You would see them with red cross aprons, and sometimes with red cross painted helmets as well. 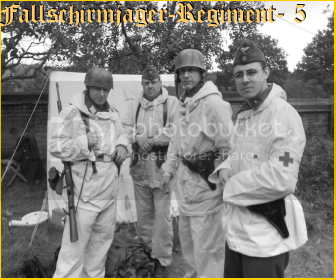 The Hilfskrankenträger was a normal soldier (with very basic first aid knowledge), with yellow tabs and full combat wear. Would only wear Red cross armband after a cease fire. The Krankenträger would have more medical knowhow but less than the unteroffizier. He would still wear yellow tabs. Now this is where the grey area is. With the FJ, it was a jaeger first, and a medic later. Therefore if the he had jump training, he would have been primarily jaeger even in 1944 normandy. But this wasn't the case with other branches. If the medic was a replacement, or coming from a different korps, he would have been acting like an army medic just the same. The 1944 period was very confusing, and I would imagine that you can find all sort of circumstances. As for the Sanitätsunteroffizier and higher ranks, blue tabs are in order and the same equipment and gear as other branches would hold. Hope this gives you a clearer idea. Unfortunately, I didn't come accross any literature on FJ medics, so we can only base our assumptions on expriences and period photographs.